Is it possible you don’t actually know how to best help your child actor rehearse for auditions, plays, or any other kind of acting work? Hey, you mean well. But you might not realize your loving feedback on your kid’s acting may not actually be helping them. You might be saying things like, “More sad”, “Less angry” or (gasp) one of the worst offenders: “Smile!”. You might even be giving them notes that are your choices and not theirs. It is not helpful to tell an actor to play an emotion. This is what is referred to as “result oriented” direction. Actors need actions. So how can you help your child actor rehearse their songs, monologues, etc. in a way that actually supports them and makes their performances stronger? First thing, send them to this blog to watch/read all my free lessons on technique (this one is good among others). There’s a lot to get into when it come to how to rehearse (including posts like these). Do your best to avoid overtly directorial notes when working material. By this I mean notes that are choices. 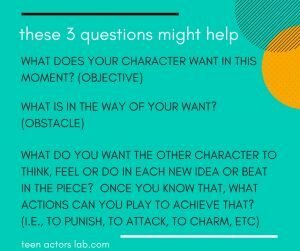 Instead, ask your young actor questions to get them thinking. You can help by reading the script/play (whatever material is available) and make sure their choices are supported by the text. If not, you can ask them questions to help guide them to better choices that are. Also help them avoid simply memorizing and “running it”. This is a great way to cement in poor habits and choices. If there’s time, a great way to work is to try so many things out and rehearse so much they just learn it. Check out the image below for 3 questions that will help get you started in the rehearsal process, especially if they get stuck. If you’d like to get your hands on 10 more questions like these plus several vital audition “dos and don’ts”, sign up below to get this free resource I created to help parents help kids.